Following a drive to Chanfi village, the trek begins from the amazing Jhula Pul built by the British in 1910. Enjoy the view of the Kalsa river as you begin your trek along the river banks, and crossing it twice on stone paths (or barefoot if you choose). After 1.2km you reach the gates of Soulitude by the Riverside where you can relax at our riverside shacks and have lunch from fresh organic farm produce growing in the fields. There is a further trek to the mystical and enchanting Parital (less than a km away). You walk along and in the river bed, occasionally navigating small rocks to reach this pristine location that gradually reveals itself during the trek. Its magical and an experience that you will not forget. There are several other treks that originate from our riverside property, including an intense 3 hour trek up to the top of the hill as you navigate 102 bends on the walking path to reach Bamitha gaon. Fantastic views of the entire valley and Parital await you. You can also return via a different route which includes a road walk, visit to the local temple and downhill via the pine forests to reach back. 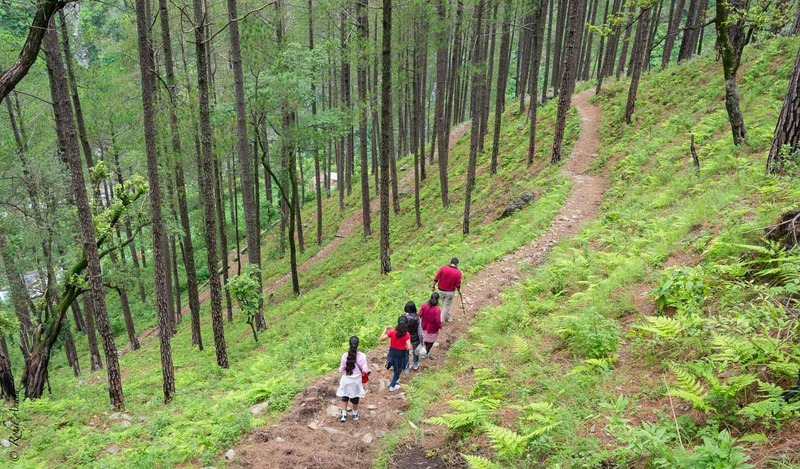 The 800m uphill trek via the pine forests to the road head and the local temple (a further 400m) is an aerobic workout with views of Parital and pristine forests.